Do you enjoy bone broth? By the mug or the bowl, broth is good, nourishing stuff. I've been consuming lots of bone broth for a long time, so I need ways to make an old favorite into something new and exciting. Some of you, however, may not like bone broth. Perhaps this will help make broth more appealing, so you too can enjoy this nutrient-dense food. 1. Fortify your bone broth with gelatin. Gelatin is full of protein. Adding gelatin to broth enhances broth's ability to coat the digestive lining for healing, which in turn feeds the cells that line the gut so that they may regenerate. If you've seen the way I make bone broth, I harvest the broth from bones that have boiled for 24 hours, serving or storing it for future use. Then I add new water and salt to the old bones and boil them again for an additional 24 to 48 hours. This last batch of broth is rich in minerals but it will no longer set up, a sure sign of deficient gelatin. To amend this, add 1 Tablespoon of gelatin per serving to the finished, cooled broth — then reheat. This way you get the gelatin you derive from your first batch and the mineral richness that comes from the latter batch. Steeping fresh herbs in broth is a lot like making savory tea. It's delicious! Take a generous sprig of rosemary, tarragon, fresh basil, oregano, thyme, and lavender, and place them in a mug with the twiggy side facing up and sticking out, as a handle of sorts. Then pour in the hot broth and let the herbs steep for 5 minutes. Pull the herbs out by the “handle”, or leave them in while drinking your brew. Flavor-wise, it's so exciting, and of course, herbs add healing properties. Allow your broth to cool just slightly, then place it in a blender. Add 2 Tablespoons grass-fed butter or ghee for every one 12- to 16-ounce mug of broth. Blend on speed 2 (or medium-low) for 10 to 12 seconds and serve. The broth will be creamy and a bit frothy. Make sure to add some quality salt for the right balance of flavors. Yummy! Cook veggies in simmering bone broth or steam them beforehand. Carrots, winter squash (this can be baked), zucchini, fennel, celery root, and red bell pepper all taste great. Cook them until they’re very soft to support easy digestion and allow to cool slightly. For every 3 cups broth, add 3 cups loosely packed cooked veggies. Use caution when blending hot liquids. Puree veggies and broth on medium speed for 30 seconds, until completely smooth. Add a 1-inch nub of fresh ginger for some pizzazz and even more digestive benefits, 1/4 cup bacon fat or butter, fresh or dried herbs, and salt to taste. Blend again. Drink bisque from a mug. Lovely! 5. Poach meat or eggs in the broth. There are so many reasons to choose this last option. First, it is relatively effortless to make broth in a Crock Pot. If you add meat to the simmering pot of broth, as one sees in Asian homes and Hot Pot restaurants, your meat is cooked without any extra work on your part. Additionally, it will add flavor and gelatin to your broth, making your broth even more nutrient-dense and delicious. While boiled meat has little appeal, meat poached in gently simmering broth will yield a moist outcome. Try adding chicken to your pot, then shredding it for Mexican food. Add pork shoulder or country style ribs to your pot and use the fall-apart meat for stew or a casserole. Add any variety of meatballs to your broth, then serve with pasta, in a soup, or in a sandwich. The options are limitless; and as I said before, this method gives the cook a well-deserved break! You can actually hard-boil eggs in broth — adding calcium to your broth as you go! I use this method weekly, and so far, dropping cold eggs into simmering broth hasn't once caused the eggs to crack. The eggs are conveniently cooked, and the broth is, once again, more nutritious. Do you have any additional tips? 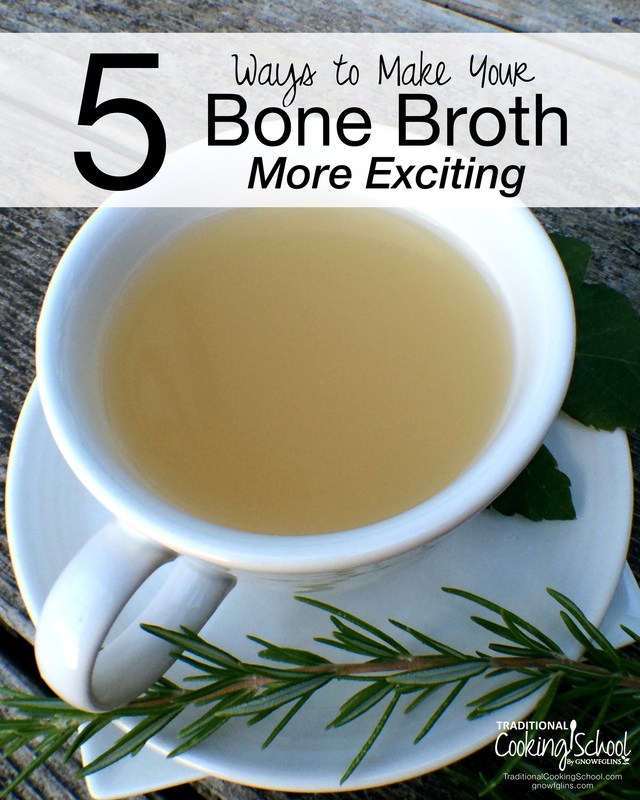 What are your favorite ways to make your bone broth more exciting? Great tips! I like adding dried turmeric to my mug of broth! That sounds lovely. Thanks, Lindsey! I never thought of making two batches of broth with the same bones, I’m going to try that next time. And I love the boiling eggs tip too! that is awesome to boil eggs in the broth! LOL, yep! 😉 Glad that tip is helpful! I add alot of supplements to my broth so I can get them down…powdered turmeric (rly dislike this), pepper, dulse flakes, powdered gooseberry (this is nasty stuff), powdered kelp, vinegar and coconut oil. Well, if it’s not yummy at least it’s good for you! 😉 Thanks for sharing! I add 3 raw beaten eggs to my hot bone broth, makes a lovely version of egg drop soup! I love these tips! especially steeping with the herbs; I’m going to try that. I put 1/4 pound liver in the pot when making broth and strain it out along with the bones. Great idea! I did that once with liver cubes and my kids, who don’t love liver, were none the wiser. Thanks for that reminder! I am new at this, thank you for the info and helpful comments. Looking forward to learning! You’re welcome! I’m so glad it was helpful. Must of the time I add some vinegar to soups that are made from scratch. It removes more minerals from the bones. If you put a wishbone in vinegar overnight, it turns that bone into rubber. Why not put the minerals in the broth? Yes, indeed! I personally leave the vinegar out, due to a fruit allergy. But that’s right; it’s a helpful component for those who can have it. Thankfully, even salt helps to extract the minerals you mention; so bone broth is nutrient-dense with either preparation. Hi Megan, I am excited to read about your ideas with broth. I am from Australia and have a varied diet and will try anything. But every time I travel overseas (usually a Seabourn cruise) I always end up in bed for a few days with stomach pain and mild vomiting. The only thing I really change in my diet is that I eat a lot of sliced fruit which I rarely do at home. I also have Congee most days as I feel it has healing properties. I am thinking about having your broth daily up until we leave (December 2) and a probiotic from now on. What are your thoughts? Hi Paula, the broth is so lovely and healing; but it depends on the cause of your vomiting, whether or not the broth will help. Is the sickness when you return home or when you first arrive? 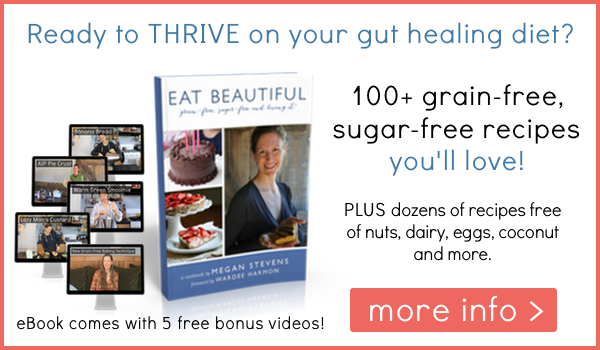 The probiotic is surely a good idea, and adding in a prebiotic may help as well, like Biotagen. But I’m not sure any of this will prevent the pain and vomiting as it’s hard to understand why it’s happening. If you can explain or understand that… it will help you figure out a good solution. Either way, if you drink the broth while sick and recovering it will surely hydrate you and help to nourish you back to health. Blessings! I’m wondering if I can use bones that have been in my refrigerator for about 6 months! How long do you cook the eggs for hard boiled in the broth?